1. Mix all ingredients lightly together. Adjust seasoning with sea salt and freshly ground black pepper. 1. Place sugar in sauté pan; add 1/4 cup tangerine juice. Stir over low fire just until sugar is melted. Pour everything together into small pan and place into the freezer. 2. When it starts to freeze up, begin scraping with a fork to make flakey. 1. Slice kumquats and olives. Toss all ingredients together and season with sea salt and freshly ground black pepper. Divide the tangerine granita into the bottoms of 6 chilled Martini glasses. 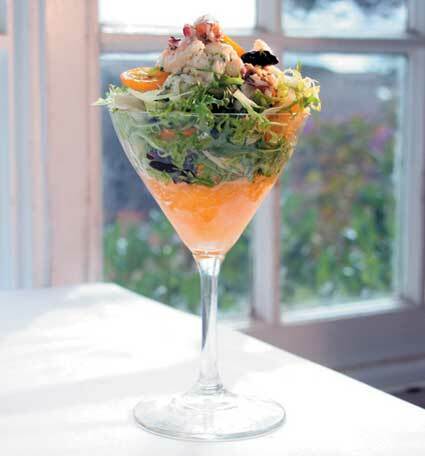 Do the same with the salad, placing on top of the granita into a nest shape. Place the crab on top of that and garnish with a crab leg and sliced olives and kumquats.